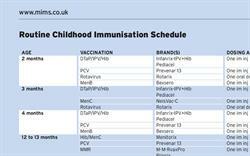 Quickly refresh your knowledge of vaccinations recommended at each age with this table summarising the current UK routine childhood immunisation schedule. The table starts at 2 months of age with the combined diphtheria, tetanus, acellular pertussis, inactivated poliovirus and Haemophilus influenzae type b vaccine (DTaP/IPV/Hib) along with pneumococcal (PCV), rotavirus and meningococcal serogroup B (menB) vaccinations and ends at 14 years of age with meningococcal serogroup A, C, W135 & Y vaccination, and the combined diphtheria (low dose), tetanus and inactivated poliovirus vaccine (Td/IPV). The 3-month immunisation is DTaP/IPV/Hib and rotavirus and the 4-month vaccination is DTaP/IPV/Hib, PCV and menB. At 12—13 months, Hib/MenC, PCV, measles, mumps, rubella (MMR) and menB are given. 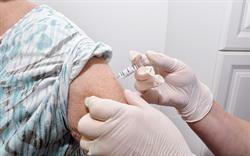 Intranasal influenza vaccine is recommended for 2 to 8 years (including school years 1, 2 and 3). At 3 years 4 months to 5 years, vaccines are dTaP/IPV and MMR. 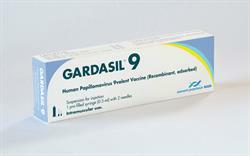 Girls are routinely given the human papillomavirus (HPV) vaccine at 12–13 years of age. The brand names of the vaccine combinations or single vaccines are given as well as the dosing and route of administration (im injection, oral or nasal application). Brand names link through to full MIMS entries for more detailed prescribing information on each product. Where to get further information on vaccinations and where to order.